The Australian Securities and Investments Commission and Australian Taxation Office are becoming increasingly concerned about the role that pre-insolvency advisors play in promoting illegal phoenix activity. Illegal phoenix activity occurs where the directors of a company liquidate or abandon the company with the intention of avoiding its obligations and then continue the same or a similar business via a new or related company. Pre-insolvency advisors who counsel directors to engage in illegal phoenix activity are subject to liability under a range of corporate, labour and taxation laws, as well as licensing and professional conduct rules. These advisors may be either qualified professionals, such as lawyers and accountants, or unqualified “turnaround specialists”. This article explains how the existing laws and rules apply to advisors and also suggests a number of legislative and administrative reforms aimed at curtailing their participation in illegal phoenix activity, with a particular focus on early detection and prevention mechanisms. Recently, the Australian Securities and Investments Commission has placed considerable emphasis on the important distinction between “general advice” and “personal advice” under Ch 7 of the Corporations Act 2001 (Cth). The distinction, however, has not received any judicial consideration. Accordingly, this article approaches the issue as a matter of first principles. It suggests that the best interests obligations under Pt 7.7A provide valuable guidance in interpreting and understanding the concept of “personal advice”. In particular, the provider of personal advice is the individual who deals directly with the client. The article also considers the meaning of several statutory concepts critical to the definition of “personal advice” under s 766B(3). Further, the article offers practical guidance as to the operation of the two limbs of s 766B(3), including the operation of a general advice warning. 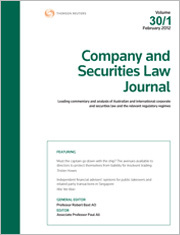 Part I of this article, published in (2015) 33 C&SLJ 372, analysed the impact of the Personal Property Securities Act 2009 (Cth) on the rights of execution creditors over personal property, solicitors’ liens and the settlement of litigation and claims. Part II, the final instalment, explores the effects of the Personal Property Securities Act 2009 (Cth) on litigation by secured parties, and other provisions in the act likely to produce litigation and judicial determinations. The phrase “persons who commonly invest” is important to the application of Australia’s continuous disclosure and insider trading provisions. Differing views have been expressed by Australian courts as to the meaning of the phrase, including as to whether it embraces the infrequent or unsophisticated investor. The apparent position in Australia, as reflected in the recent decision of the Full Court of the Federal Court in Grant-Taylor v Babcock & Brown Ltd (in liq) (2016) 245 FCR 402;  FCAFC 60, is now at odds with Singapore, where the insider trading legislation is worded in virtually identical terms. Given the uncertainty in the case law, as explored in this article, the position may have been reached where there is a need for legislative amendments to clarify the test to be applied. Recent legislative reform in Singapore supports that course. Provision of financial advice within Australia’s financial services market has been, and remains, the subject of considerable regulatory scrutiny and legislative activity. The Australian Securities and Investments Commission (ASIC) identified high levels of non-compliance in the quality of advice given, along with misaligned incentives in remuneration arrangements, as exacerbating conflict of interest problems. The Trowbridge Final Report, Murray Inquiry and a Parliamentary Joint Committee similarly recommended the need for reforms around advisor/licensee remuneration arrangements, client engagement, and education, training and professional requirements. Collectively, these reports and inquiries have informed the package of life insurance remuneration and financial adviser competency reforms introduced by the Corporations Amendment (Life Insurance Remuneration Arrangements) Act 2017 (Cth) and the Corporations Amendment (Professional Standards of Financial Advisers) Act 2017 (Cth). This article considers these new Acts, the market context and rationale driving reforms behind them, and the potential for further reform measures on the horizon. For the PDF version of the table of contents, click here: Westlaw AU – CSLJ Vol 35 No 8 Contents or here: Checkpoint – CSLJ Vol 35 No 8 Contents.